1. Find a centre point on the polystyrene board. Place a nail in the centre and attach builder’s twine- find the circumference of the circle and use a pencil to draw out. 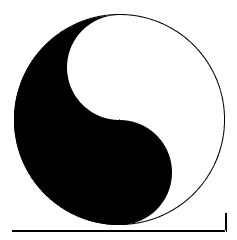 3 Cut along the line of the Ying and Yang shape to create 2 pieces of the circle. 4. Put back the one piece into the polystyrene board to create a mould. Place the PVC cut out / circular hollow to create a hole for pebbles. 5. Mix 2 buckets of stone, 2 buckets of sand and 1 bucket of cement with enough water to form a yoghurt type consistency. 6. Pour in the concrete mixture into the polystyrene Ying and yang mould. Make sure that you leave the pipe cut-out empty. 7. Use a trowel to spread the mixture and then smooth down to create a smooth finish and leave it to dry for three days. Do remember to turn the PVC cut-out while the Ying is drying as this will make it easier to remove when dry. 8. When the Ying and Yang have dried – use a serrated blade knit to remove the polystyrene mould. Remove the PVC pipe cut out / circular hollow object from the pavers. 9. Place the Ying and Yang in the garden then add the black and white pavers or whatever colour you like. 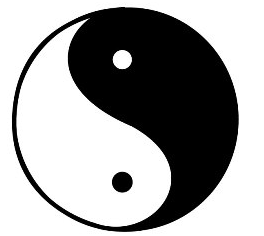 You will have to cut 2 circles out of the polystyrene board to make one complete board- one side at a time, meaning one for the first three days, then you move on to the other piece of the Ying and Yang.